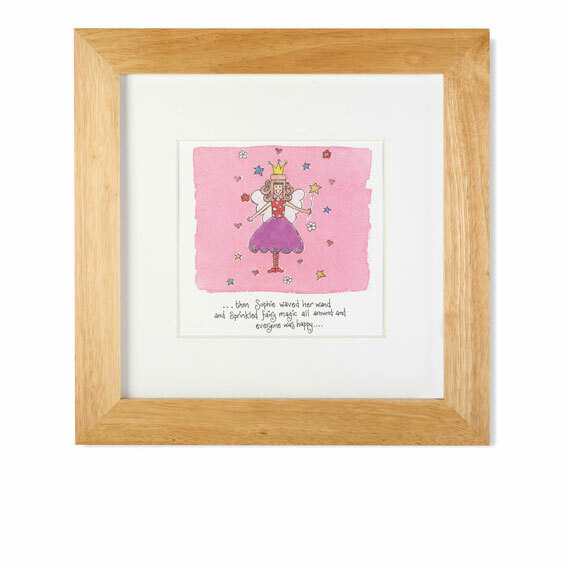 This beautiful framed watercolour print by The Dotty House makes a perfect gift for a Christening, new baby or birthday. This fairy design is highlighted with sparkly glitter and personalised with a handwritten message of your choice. The frame is 45cm square and has a hanger for easy attachment to your wall and is made of a light coloured wood and glass.Your watercolour will be personalised with the exact lettering you provide. Please ensure that you enter the name and date or message accurately as we cannot accept returns due to customer errors.